Gisele Bündchen and Tom Brady have bought a $14 million apartment in New York City on the 47th floor of One Madison Park tower which gives incredible views across the city. Gisele Bundchen and Tom Brady have bought a $14 million apartment in New York City. The Brazilian model - who has a net worth of $42 million - and the American football star are opting for a three-bedroom, full-floor condominium on the 47th floor of luxury residential tower, One Madison Park, which is located at the foot of Madison Avenue in Manhattan, giving incredible views across the city. The apartment's panoramic views pan north, west and directly up Madison Avenue and allow the pair of them to look out across the city and see the breath taking skyscrapers, much like the iconic image of Batman looking out onto the fictional city of Gotham which is based on New York. The interior of the apartment fashioned by Danish designer Thomas Juul-Hansen, boasts white oak plank floors, huge doors, a master bedroom with plenty of space and his and hers closets which give them ample room to store their clothes not to mention a master bathroom. The glass tower suffered from financial difficulty in 2007 but was rescued by real estate firm Related Companies who attracted potential buyers including A-Lister Leonardo Dicaprio and Vera Wang. 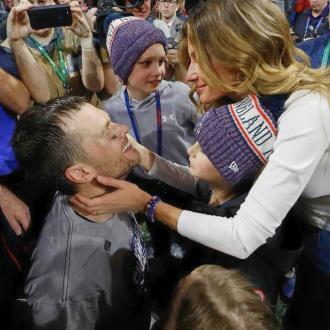 Gisele and Tom also have a 14,000-square-foot mansion in Los Angeles and are currently building a similar-size property near Boston.